non-removable battery, or hardwired to the home. to be powered by a 10-year, sealed, non-removable battery, or hardwired to the home. While these 10-year smoke detectors have a larger upfront cost than traditional alarms powered by replaceable batteries (approximately $20 per unit) the lack of yearly battery changes makes them cheaper over the life of the device. 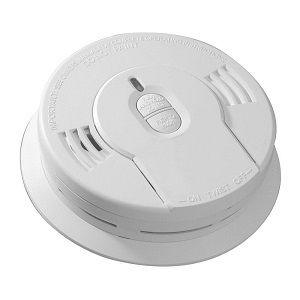 As with ALL smoke detectors, the Harris Hill Volunteer Fire Company recommends that the 10-year sealed smoke alarms still be tested at least twice each year using the button on the front of the unit to ensure they are working properly. Do I need to replace the alarms I have installed already? 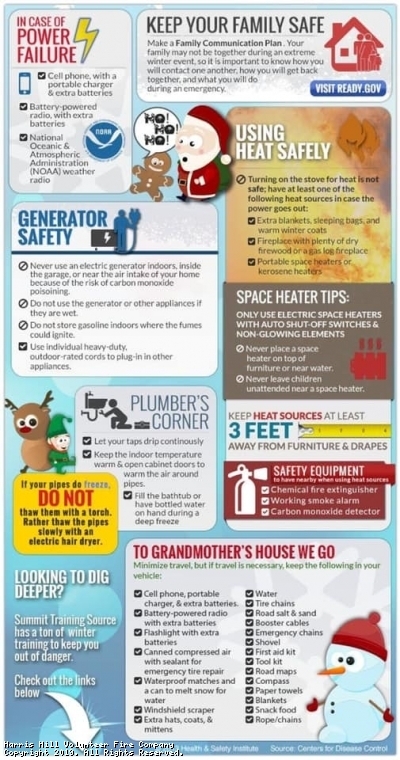 You are not required to immediately replace your current smoke detectors, but any that are replaced or added after April 1st are required to be 10-year battery powered or hardwired. After this date, traditional removable battery smoke alarms will be unavailable for purchase in NY State. Will I activate the alarm when I'm cooking something? No. There are 10-year sealed alarms specifically designed for the kitchen with advanced sensors that can tell the difference between cooking smoke and real fire. Why did the law change to require these upgrades? The dangerous habit of disabling or removing smoke detectors after an accidental alarm while cooking is a major part of why this new legislation went into effect, so alarm manufacturers considered this issue in the design of 10-year sealed alarms. You are very likely to experience less nuisance alarms than you did with your traditional battery alarm. There are advantages to both systems. Hard-wired smoke alarms tie into your home's wiring and require professional installation, but generally do not require battery changes unless they feature a backup battery. 10-year sealed battery-only alarms are simple to install, and they work during a power failure. All smoke alarms have a life span of 10 years, sealed or non-sealed, and should be tested on a regular basis. When the battery wears out in a 10-year sealed alarm, the entire unit must be replaced, which helps prevent outdated units from staying in operation. Ionization and Photoelectric Detectors - What's the Difference? Smoke Detector Law in N.Y.S. 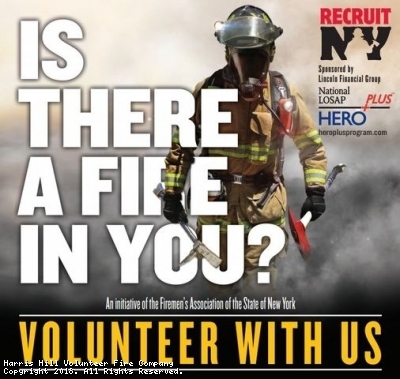 If you live in, or near the Harris Hill Fire Protection District and want to be part of a rewarding volunteer organization, we want to hear from you. Interested in what Harris Hill firefighters are doing? Click Here and Like us on Facebook! ***We accept members ages 14 and above. The Explorer Post is limited to those ages 14-18. Those older than age 18, qualify for active membership, and should message us to join today! Calling all 14-16-year-olds in Clarence and Williamsville, are you interested in trying something new? Want to face different challenges? Want to embark on a challenging and rewarding journey? Our program offers free training, college scholarships and tuition reimbursement, community service hours, and the opportunity to serve your community in a rewarding way! If this looks interesting to you give us a try. The Harris Hill Volunteer Fire Company explorer post 114 is currently looking to recruit you. Please private message us, or apply today at hhvfc.com! 6 Firefighters took part in the Fight For Air Climb this past weekend, raising money for the American Lung Association! Firefighters climbed 26 floors in full turnout gear! Harris Hill Firefighters collected over $5000 for the Variety Club at two boot drives held over the past few weeks!! We would like to thank all who generously donated!! 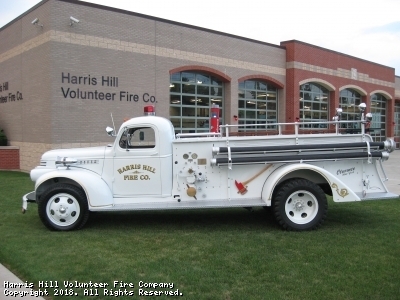 The Harris Hill Volunteer Fire company was started on January 7th, 1937, with John H. Farrell acting as President and Chief to fifty brand new firefighters. The bi-monthly meetings were held at various members homes, the school basement, or The Rose Garden on Wehrle Dr. They battled fires with one truck, and didn’t even have an established district until 1939. Some of their first equipment included a dozen rubber coats and boots they purchased for $10.50. To raise operating funds, the new fire company held "Smoker Parties" every few months. The first Monte Carlo party required an outlay of $209.55 and returned $210.85. The signing of the Fire Protection contract with the Town of Clarence in 1941 eased financial worries. The Town of Clarence paid 1/10th of the assessed valuation of all homes in the district. At the time of signing, it came to about $550.00. Harris Hill got its first loan from the Bank of Williamsville when they borrowed $200.00 for a Federal Fire Siren that they had installed on top of Metz's Garage at the corner of Main St. and Harris Hill Rd. One blast of the sired indicated a meeting, two blasts indicated a drill, and three blasts meant a fire! World War II brought many changes to the Fire Company. Blackout drills sometimes consisted of simulated bomb hits to which the firemen responded. In 1942 a government-owned Curtiss P40 airplane valued at $60,000.00 went up in flames on Transit Rd. a half mile North of Sheridan Dr. The gas tank blew up and the airplane was a total loss. The war also necessitated the purchased of war insurance on the fire truck. The truck, which was stored in Metz's Garage, had to be guarded every night by volunteers. The Harris Hill Firemen's Club was established in 1951. It was a restaurant that served dinners at the fire hall Wednesday through Saturday evenings and featured dancing on Saturday nights. All monies beyond expenses were turned over to the Fire Company. At its peak, the Firemen's Club had 851 members! The Club was discontinued in 1967 because it couldn't compete with commercial restaurants. Volunteer Firemen's Sunday, was initiated in our area by Firefighter Walter Pfeil in 1959. Mr. Pfeil wrote a column for the Clarence Press entitled, "Safety and Fire Facts." 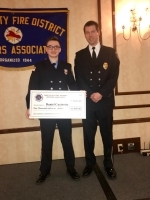 He also encouraged the Fire Company to offer a creative writing award to high school students, which was posthumously named after him and is still awarded today. In the 1960's Harris Hill Firemen resisted moves toward providing ambulance service. During this time, the Junior Chamber of Commerce tried to donate an ambulance, but it was refused. In 1965, after Clarence Center Volunteer Fire Co. complained that 75% of the ambulance calls they received were in the Harris Hill District, a fee was sent to them to encourage their continued service. In June 1965, Harris Hill adopted a resolution to provide ambulance services. On February 2nd, 1970, Clayt Ertel Sr. introduced the Exempt Firemen's Club, as a service organization for the firemen to promote the welfare of the Harris Hill Volunteer Fire Company. In 1971, The Eastern Hills mall opened on the western borderline of our district which is Transit Rd. The building boasted a total size of 997,945 square feet and 92 total stores with 7 additional anchor stores. In 1978, a New York State Human Rights Law against sexual discrimination went into effect. It required a constitutional change which allowed Patricia Grogan to become Harris Hill's first female member. The fire district saw tremendous growth during the middle to late 1990s. The entire western border line of Transit Road grew uncontrollably to quickly become the second largest commercial fire district in all of Western New York. Additionally, the fire company saw several new subdivisions created, all which doubled the call volume. In 2001, The Harris Hill Volunteer Fire Company Explorer Post 114 was started. It consists of a group of 14-18-year-old high school students who are interested in helping the community. Today the program is still functional and is a key resource to the recruitment of new firefighters. During the summer of 2005, Harris Hill moved into their new fire hall located in the lot to the east of the old fire hall. The new building is led certified (green energy conservancy). It contains ample office space for each firematic and administrative officer, as well as rooms for physical fitness and a training classroom. The new fire station has a seven-bay apparatus room, allowing each truck to have its own bay. During the 2018 calendar year, Harris Hill answered 629 calls for help and today the Harris Hill roster consists of 63 active members; that dedicate their time and effort to protecting the residents within the Harris Hill Fire Protection District. HHVFC answered 89 calls for help during the hours of 11 p.m. and 7 a.m; 283 calls for help during the hours of 7 a.m. and 3 p.m.; and 257 calls for help during the hours of 3 p.m. and 11 p.m. The Harris Hill Volunteer Fire Company has been through several changes during its history. The diversity of the people and the times have made the fire company a thriving organization with the brightest of all possible futures. Today the fire company is very active in the community, continuing to strive to be the best, and of course always be ready when called upon. 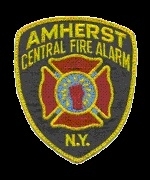 Listen to a live audio feed of Amherst Fire Control. This site has been viewed 358,523 times.